Posted on January 29, 2018 by treelawyer	tagged. Don’t ever let your local attorney pull an abscessed tooth. And do not let your dentist practice law. Dr. Ma needed a new office after he lost his lease to redevelopment. He found a vacant dentist’s office next to a vacant church. The empty dental abatoir was run down and needed work, but otherwise it was perfect. Dr. Ma signed a purchase agreement, which expressly advised him not to rely on anything the seller or his broker said, but instead to hire his own consultants to check the place out stem to stern. But Dr. Ma was a dentist. 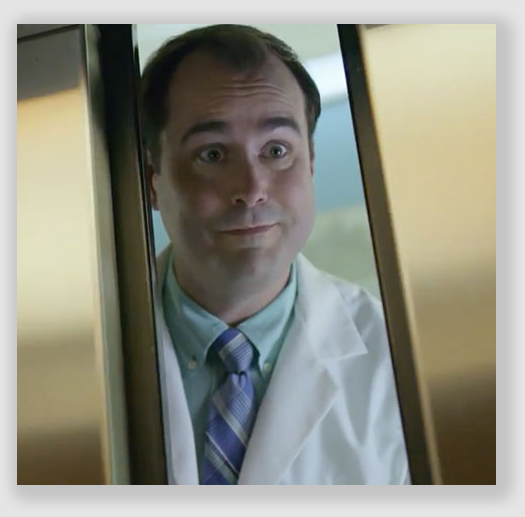 According to a current ad campaign, dentists can fix stalled cars, stop bank robbers in their tracks, free people trapped on an elevator… all sorts of stuff. Sort of like Macgyver with a mouth mirror. Dr. Ma didn’t need any other licensed professionals to check the property out. He could handle it. 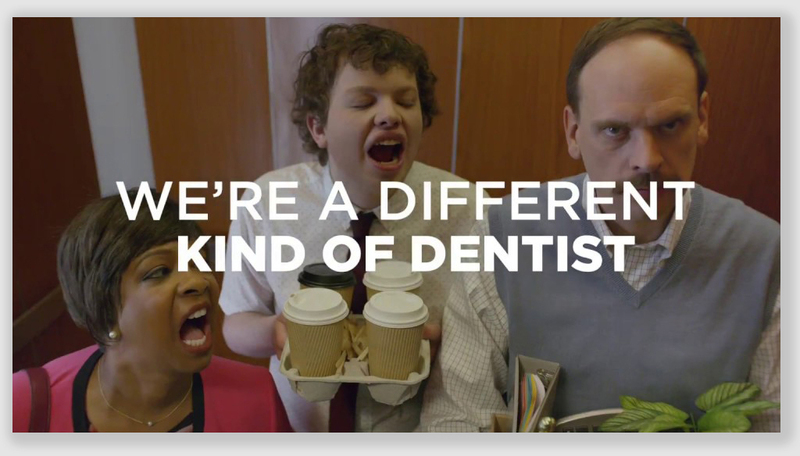 He was, after all, a dental professional. Dr. Ma would never miss a cavity. But he did miss the fact that the property’s fenced side yard, which was the only access to shed in which he had installed the air compressor that ran all of his dentist stuff, was really not his at all. Instead, almost all of it was part of the church. In fact, the 6-foot fence that enclosed the side yard was 3½ feet onto the church land. A few months and countless fillings later, Dr. Ma got a letter from the church property owner, saying Grace Chinese Alliance Church wanted to buy the church property, but a survey showed Dr. Ma’s shed and fence was on first land. Dr. Ma should have referred the matter to legal counsel right then, but he was a dentist. A trained professional. He had this covered, too. The good doctor wrote back, saying “no problem”: the church property owner could remove the fence whenever it needed to. Based on this answer, Grace bought the vacant church. However, 8 months later, when the Grace Church elders were ready to have the fence moved back to the real property line, Dr. Ma told them to go floss. Hd told them they could not move the fence, and if they tried, he would give them a root canal without novocaine. Or call the police. Or both. First Dr. Ma said “yes.” Then he said “no.” Up and down, kind of like a yo-yo. “Yo-yo” Ma, it seemed. The Church was not about to turn the other cheek. It sued, and Dr. Ma – who by now had a lawyer – claimed he had a prescriptive easement. Everyone is familiar with adverse possession. If you squat on someone else’s land long enough without their permission, the property may become yours. 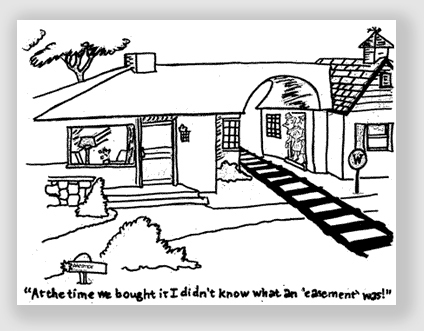 A prescriptive easement is the easement version of that, a right to use a portion of someone else’s property gained by brazenly using it without permission for a sufficient period of time. If a claimant uses a property owner’s driveway without permission to reach the claimant’s back lot, and does it openly, regularly and continuously for long enough, the claimant gets a prescriptive easement. It does not prevent the property owner from using his own driveway: rather, it just lets the claimant use it, too. A true prescriptive easement does not deprive the property owner of the right to use the affected property, but rather just limits that use in favor of whatever rights the claimant has established. Dr. Ma argued he had a prescriptive easement, but his failure to determine the boundaries of his own property when he should have and his promise to let the Church move the fence when it needed to didn’t help him make his case. The real problem, however, was that Dr. Ma wanted exclusive use of the disputed property, and if he got that, it would deny Grace Church the ability to use the disputed property at all and would frustrate Grace’s intended use of the vacant chapel as its place of worship. 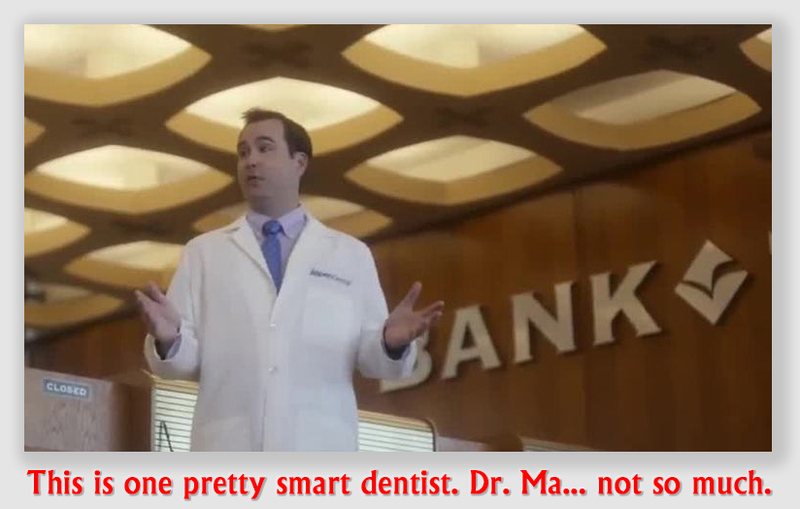 That dentist-as-MacGyver ad campaign we mentioned promise a “different kind of dentist.” Dr. Ma should have been a different kind of dentist: the kind who uses surveyors and lawyers early enough that these sorts of problems don’t happen. In 2010, Dr. Ma was looking for a commercial property to which to relocate his dental practice. The property at issue in this case, the Hayden property, had been used as a dental office at one time, but it was vacant and in disrepair. Dr. Ma met with Hayden’s real estate agent to look at the property. One of Dr. Ma’s concerns was having a place to locate the air compressor used to power his tools. He discovered that the property had a compressor room, accessible only from the outside from a yard along the side of the building adjacent property owned by Grace Chinese Alliance Church. The side yard was completely fenced in; it was about six feet wide from the building to the fence. After closing, Dr. Ma moved his dental practice into the Hayden property. A few months later, he received a letter from a lawyer for Grace Church, who said the Church property was subject to a sale escrow, and that a boundary survey conducted in connection with the sale showed that a fence and shed along Hayden’s east property line was encroaching into the Church property by about 3½ feet along nearly the entire length of the boundary between the two properties. The letter asked Dr. Ma to agree the encroachment could be removed, and Ma replied, “We have no problem with whatever you want to do with the fence as long as it is on your property. Please let us know your future plans if the fence is removed, so that we can prepare for any security issues to our office related to this.” In reliance upon Dr. Ma’s friendly response, the Church completed purchase of the Church property and began renovations. Eight months later, Grace Church’s pastor wrote to Dr. Ma, telling him that for the Church to meet City codes for parking lots, it had to move the fence to the correct property line, and a piece of the encroaching shed had to be torn out. which required the Church to repave the entire parking area. The Church offered Ma $500 to help him defray the costs of compliance. This time, getting Dr. Ma’s cooperation was like pulling teeth. He wrote back, telling the Church its survey was both unrecorded and bogus. The Church recorded the survey, but Dr. Ma continued to argue. He said the fence had been in its current location when he purchased the Hayden property, and he had spent more than $50,000 improving the side yard where the encroachment existed. He said his possession and improvement of the property had been open and continuous, and that the disputed property therefore was his, or, if not, he at least had an easement by prescription. He threatened to call the cops if the Church tried to remove the fence. The Church sued Ma to quiet title and get his fence and shed off of its land. Dr. Ma counterclaimed, saying he had a prescriptive easement to use the disputed 3½ feet, or at least an equitable easement. The trial record showed the fence was 6 feet tall, with locked gates on both ends, and that the Church did not have access to its property on the other side of the fence. The Church needed to move the fence in order to use the property behind it to comply with certain parking lot requirements for the Church’s conditional use permit. The trial court ruled against the dentist, and Dr. Ma appealed. The problem here is that a true prescriptive easement does not deprive the property owner of the right to use the affected property, but rather just limits that use in favor of whatever rights the claimant has established. If a claimant uses a property owner’s driveway without permission to reach the claimant’s back lot, and does it openly, regularly and continuously for long enough, the claimant gets a prescriptive easement. It does not prevent the property owner from using his own driveway: rather, it just lets the claimant use it, too. Here, if Dr. Ma got a prescriptive easement to use the disputed property, the Church could not use it at all. The fence prevented the Church from getting a permit to build a parking lot. Without a parking lot, Grace could not conduct services for its parishoners. Not only could Grace Church not use the disputed area behind the fence along with Dr. Ma, but its whole intended use of the church property would be frustrated. The Court of Appeals was probably influenced by the fact that Grace Church only bought the property because of Dr. Ma’s letter saying that the fence could be moved to the correct position. It did not help that after Dr. Ma told Grace Church that he disbelieved its survey, all of Ma’s own surveys showed Grace was right. It also did not help that testimony showed the dentist had tried to make a secret deal with the seller in order to cut out the broker’s fee, or that Dr. Ma tried to get the judge thrown off the case on a spurious claim of bias. Whatever, Dr. Ma did not come out of trial looking like someone who was entitled to equity, and things did not improve on appeal. Unsurprisingly, with regard to Dr. Ma’s request for an equitable easement, the court found the equities did not weigh much in his favor. It noted that, on the one hand, the Church was unable to function as it wanted to function because it could not complete its parking lot as required for its conditional use permit without access to the disputed property; on the other hand, Dr. Ma could not show he would suffer any comparable hardship, even if he had to move the compressor or any other equipment from the shed as a result of the fence being shifted to the correct property line. The trial court found that the Church would be irreparably injured if an easement were granted because it would be unable to function as it wanted to function. It also found that Dr. Ma failed to show he would suffer any hardship if the easement were denied that would come close to the hardship suffered by the Church if the easement were granted. Because Dr. Ma did not even try to show those findings were unsupported by the record, the Court of Appeals denied his request for an equitable easement. * The length of time needed for an adverse possession or prescriptive easement varies from state to state. California’s 5-year period is actually much shorter than virtually all other states.